Ian Balina, the famous cryptocurrency YouTuber has reportedly lost 2 million USD during a livestream. Famous for doing sponsored ICO reviews, the YouTuber was reviewing yet another ICO on his channel when a viewer notified him that “someone” had moved all of his tokens out of his wallet. Balina, however, continued with his review, not taking notice of the comment. Fifteen minutes later, the live feed was taken down by a power cut, and Balina simply continued his review a few hours later. That is when he finally noticed that he had been logged out of his Google Sheets profile. Balina is a name almost everyone knows in the ICO industry being an influencer to a lot of casual investors. He has more than 26,000 members on his Telegram channel and over 116,000 subscribers on YouTube. 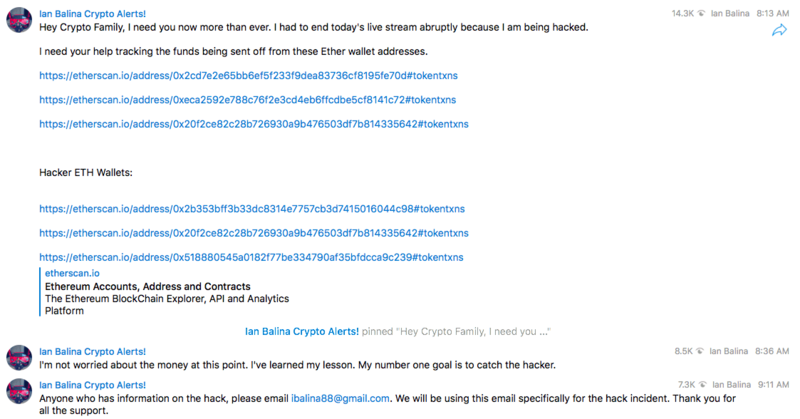 The Etherscan wallet transactions show that most of Balina’s tokens were taken from his account while he was streaming live. This included over 20 million Nucleus Vision, 2 million Pareto Network, 1 million Loom, and many others. Keep your wallets secure by not revealing any information, stay safe and follow CoinFrenzy‘s official Instagram page and Telegram channel!